A 6.9 magnitude earthquake struck the Asian nation of Myanmar at about 8:25 p.m. Wednesday night (9:55 a.m. EDT), according to the U.S. Geological Survey. The tremor occurred at a depth of 83.7 miles, the USGS also reported. 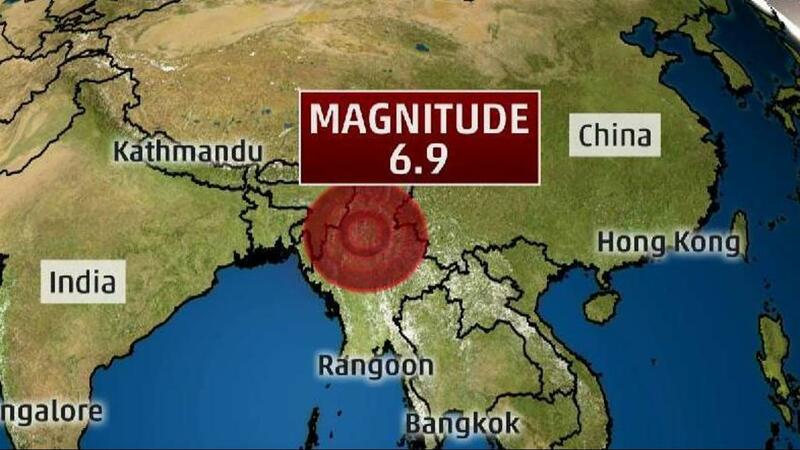 The epicenter was located 46 miles southeast of Mawlaik and 246 miles north of the capital, Naypyidaw, the USGS added. In Myanmar's main city of Yangon, a town of nearly 6 million, panicked residents fled from buildings when the shaking began, according to the Associated Press. For at least a minute, a seven-story hospital building in the city shook strongly twice, according to an AP journalist who was inside at the time of the quake. Many people ran out of the building and called family members after the shaking ceased, the report added. Authorities told the AP there were no immediate reports of injuries or damage. The USGS estimates a 63 percent chance of a death toll between 1 and 100. According to the Indian Express, 1 million people live less than 50 miles from the epicenter. Shaking was also felt in Bangladesh, Tibet and eastern India; citizens of those two countries posted videos on social media to document the quake. In the eastern Indian state of Assam, the quake was believed to be responsible for a power failure that caused outages in several areas, the AP also reported. The Duke and Duchess of Cambridge were in Assam's Kaziranga National Park during their royal tour of India when the earthquake shook the area, but a spokesperson told the AP they are safe. This is a developing story; please check back frequently for more information.